Your Not Getting My Dinner! 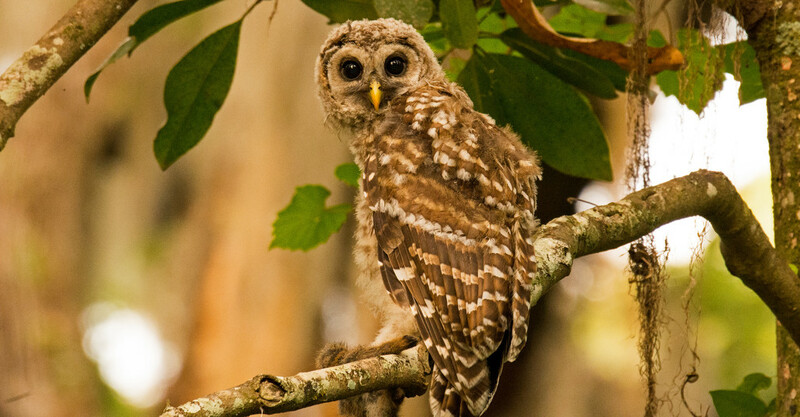 This is one of the baby Barred Owls. Had a few minutes before sunset tonight, so took a quick walk up the trail. The baby's were screeching really loud, so guess it was close to dinner time. Right after I finally spotted this one, Mom owl came swooping in and dropped off dinner, which you might be able to see, in the claw of the baby. Just wasn't quite ready for the hand off, so had to settle for this one. I love how he's looking right you! The title fits his expression perfectly. Wow, they sure have grown! Great capture and lovely details, fav!